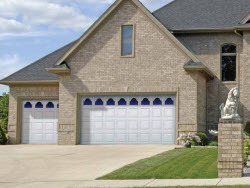 Vinyl garage doors are a great value considering their reasonable initial cost. They are only slightly more expensive than basic steel or composite wood garage doors, yet offer you a great deal of maintenance freedom if you are located in a heavy industrial region with acid-fallout that eats away at steel garage doors, or a region with extreme humidity that causes warping and buckling of wood or composite garage doors. They are traditionally styled and available in a number of window patterns and various etched glass styles. The photo at the left shows vinyl doors manufactured by Overhead Door from their Durafirm Collection 870 Series. They are constructed of bonded steel, polyurethane insulation with an R-value of 11.75, and a thick vinyl exterior skin that provide you with superior strength, impressive sound absorption and energy efficiency. The deep raised panels have rich wood grain textures for a timeless appearance of freshly painted hardwood. The finish for these garage doors is available in 4 neutral color tones that go all the way through the vinyl from top to bottom to eliminate vinyl skin scratches from being visible. The vinyl contains special polymers and UV resistant resins that protect your garage doors from harmful ultraviolet rays. Structurally, there are twin 22-gauge C-channels that run the full length of each garage door panel and are anchored to interior steel stiles for strength. If you have wind load concerns, the garage doors can be fitted with additional structural supports to meet wind load building code requirements in your local. Vinyl doors are and excellent choice if your locale requires a corrosive or humidity resistant exterior skin treatment. You should consult your local Overhead Door® dealer near you for exact sizes, styles and pricing. If you have low-ceilings in your garage, they have special track systems that will accommodate your situation. We have been following your blog and we have found a lot of useful information in it. I was pleased that I was able to easily find the proper tall storage cabinet for my garage. I needed lockable storage to keep my toddler away from sharp tools and solvents that my husband stores. Garagetips-101 solved my problem! I love the detail in your garage building pages. They helped me understand how to engineer a foundation for a garage we are planning that our building department will approve. I had the inspector go to your pages and review what I was talking about. Now, I am studying the wall framing sections, as we plan to build it ourselves this fall. Thank you so much for the great information. Great stuff on wall framing. I never really understood the on-and-off spacing concepts for the wall studs until I read your explanations. for products shown on this page. Did you know that the overhead garage door that we are all familiar with today was invented in 1921. It is a fact! A fine gentleman from Lewisville, Texas named C.G. Johnson invented the upward acting door system and in 1926 he invented the electric garage door opener. The overhead door was a huge improvement over the hinged carriage door of the day, that was heavy and always in the way - open or shut. Mr. Johnson's concept was a huge success. He aptly named his company, Overhead Door Corporation. Mr. Johnson is still with us today in spirit, as his business has grown to include over 450 authorized dealers in the U.S., Canada and Mexico.